One thing that annoys me is that in the days of geolocation and location recognition I still have to enter my country and city in forms over and over again. This is especially annoying when you like in the UK which could be anywhere in these wonderful large dropdowns (UK, England, Great Britain, United Kingdom, Blighty…). There are many geo lookup tools and a lot of (at least UK) web sites started doing post code lookup tools. This is cool, but as annoying when I spent another reload of a full large form for a postcode lookup that went wrong. With the UK being quite a mess when it comes to post codes this is not uncommon. geofill.find(properties) does an IP lookup of the current user and tries to get the geographical data from that one. 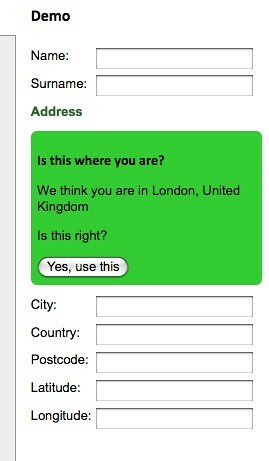 geofill.lookup(properties,postcode) tries to get the geographical data from the postcode provided in your form.